Brain haemorrhage due to stroke. 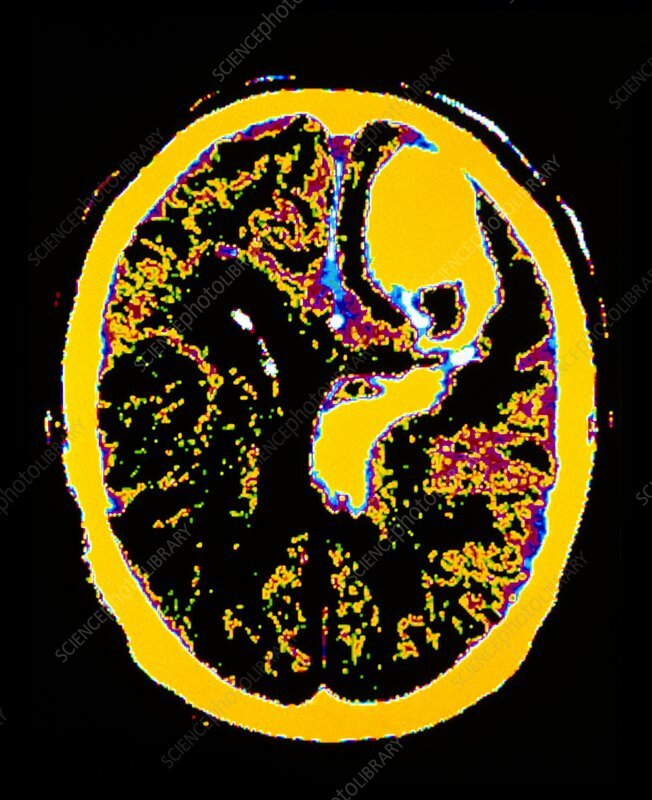 Coloured computed tomography (CT) scan of the brain seen in axial section showing a brain haemorrhage due to a recent cerebrovascular accident, or stroke. The orange area at left is a blood-filled area, or brain haemorrhage. Stroke is a major cause of death in developed countries. If patients survive, damage to the brain can cause varied symptoms. Strokes that affect one side of the brain, like this one, often result in weakness or paralysis of the opposite side of the body. If the dominant cerebral hemisphere (usually the left hemisphere) is affected, speech and language may be impaired.